This is perhaps the best sequel ever made. The only other two sequels ever worth mentioning are Star Wars: The Empire Strikes Back and Aliens. It is the only sequel ever to win an Academy Award for Best Picture. It also makes history for the performance of Robert De Niro who won Best Actor for his performance of Don Vito Corleone; two years prior, Marlon Brando won Best Actor for playing (that word seems inadequate somehow) Don Vito Corleone as well. Thus, it is the only time in history that two actors have won Best Actor for being (this word is more appropriate) the same character. If you have read my review of The Godfather (Part I), then you already know that I like the first one better than this one. However, I still love this movie and I have included it in my list of favorite movies of all time. The reason that I like The Godfather over Part II all comes down to Marlon Brando. His performance of Don Corleone simply cannot be touched; it is superb. De Niro does an excellent job at portraying the younger Vito Corleone, but does not rule the screen in the way that Brando did; Pacino, for his part, got about as close as an actor could get as far as trying to match Brando's performance, but I believe Brando, and Part I, still win out. The story of Part II is captivating, which enables one to sit and watch for the over three-hour duration of the film and not even realize how much time has passed. It really gives new life to the original as it expands and grows the story in two different directions. First of all, there is a flashback to well before the first Godfather movie showing a young, 9-year-old Vito Adnollini (later named Corleone) who is orphaned in a matter of days as his entire family is wiped out by the local Mafia Chieftan. His life is in jeopardy too, and he flees to America, with the aid of some sympathetic Sicilians. Upon arriving as an immigrant to New York, his last name is replaced by that of his hometown, Corleone, and he begins his life anew...alone. It is here in New York where we see him develop into the powerful Don with whom we are familiar in the original. As his character develops (done masterfully by De Niro, who not only had to attempt to fill Brando's shoes, but also speak much of the role in Sicilian) we see several important pieces. First of all, we see his sympathy for those in need and his willingness to help people. Second of all, we see him turn from shy and obedient to bold and confident as he stands up (for himself, but mostly for his friends) to the local Mafia head. Finally, we see him become very powerful (and amazingly reminiscent of Brando's portrayal of Vito) as those he helps both support and protect him, while everyone else respects and fears him. The basic story of Vito Corleone, given above, is presented to us in a series of flashbacks, while the main focus (and screen time) of the movie is directed towards the continuation of Don Michael Corleone's reign of power. Don Michael's character is of course continued by the amazing Al Pacino who somehow did not win an Oscar for either Part I or Part II, even though he was nominated both times. This really puzzles me because he is really the most important character in either film and the one who really inspires awe. Nevertheless, Pacino offers to us in this movie a man already consumed by power and greed who continues to push for more and more, letting nothing get in his way. The irony, as we realize by the end of the film, is that even though he succeeds in getting everything he intends, he winds up losing that which is most important: his family, with whom he never spends any time (he has Tom buy his son's Christmas present). Thus, Don Vito's admonition of the importance of spending time with one's family (from Part I) seems to haunt the entire theme of Part II. And lest the subtlety of this unraveling be lost on us, we see Michael approach his mother with this almost pitiful question: "When Pop had troubles, did he ever think that maybe by trying to be strong, and trying to protect his family, that he could lose it instead?" First of all, my personal favorite scene: when Michael shuts the door on his wife, Kay (Diane Keaton, who only got better in this movie), effectively sealing her off from their kids, of whom he has taken sole possession. Her emotional agony contrasts perfectly with his cool, quiet hatred. The door is closed slowly, and calmly, and Kay's anguished face is emblazoned in our minds. 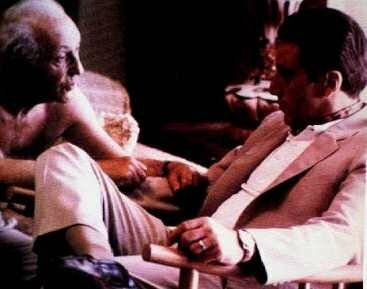 My second favorite: Michael's first visit to the Jewish crime boss, Hyman Roth. They meet in Roth's tiny TV room, as Roth finishes his supper. Their discussion is made in whispers with the TV's volume turned up a notch, so that Roth's wife will not hear them. As Roth later put it ("Michael, we're bigger than U.S. Steel! "), these two were the most powerful people in the world, and here they are, in Roth's tiny house, sneaking in a conversation away from the ear of Roth's wife, like teenagers would to evade their parents. Vito's revenge on his family's murderer. The sharp knife seemed to cut so easily through his old and fat belly. The embrace of Michael and his brother, Fredo, at their mother's funeral. Fredo, weeping like a child, in need of compassion and strength. Michael, placid and menacing, and having the audacity to seal the fate of his brother with an unseen nod to his hit-man, Neri. We are reminded of his earlier statement to Neri: "I don't want anything to happen to him while my mother's alive." "Michael, why are the drapes open? ", asks Kay, as he walks into their bedroom. Michael begins to wonder this himself, when suddenly he realizes why, and he drops to the floor just before shots begin to rain in through their bedroom window. "You heard what happened in my home? In my home! In my bedroom, where my wife sleeps; where my children come and play with their toys. In my home." Vito's unheard and unseen murder of the New York bullying crime boss, Fanucci. Immediately following this crime, we see him walk nonchalantly home and kiss his son Michael (which I interpret as being somewhat of a curse). Michael: "Was it a boy?" Michael: "Now can't you give me a straight answer any more! Was it a boy?" Continuing with the importance of male children, and on the perhaps inevitable breakdown of Kay: "Oh, oh, Michael; Michael, you are blind. It wasn't a miscarriage, it was an abortion. An abortion, Michael. Just like our marriage is an abortion -- something that's unholy and evil. I didn't want your son, Michael. I wouldn't bring another one of your sons in this world. It was an abortion, Michael. It was a son; a son, and I had it killed cuz this must all end. I know now that it's over; I knew it then. There would be no way, Michael. No way you could forgive me. Not with this Sicilian thing thats been going on for 2000 years." Then there's Roth's playful refusal to give anyone any information upon his arrest: "I am a retired investor on a pension, and I wished to live there as a Jew in the twilight of my life." The scenes are great and memorable. The acting is so powerful, and the cast is so deep. However, this movie's most profound attribute is how we can relate to it. The lives of the characters are ones which we could never live, or even begin to pretend that we have experienced a fraction of their tragic lives. Nevertheless, their emotions and struggles are ones which we immediately can identify with. Their mistakes, too, are ones of which we are often culpable (maybe not to the same extreme, but you get the idea). There are so many character types in the movie too, that many of us will likely find one character who frightfully matches our own. It is strange to admit it, but I personally identify with Michael more than anyone else in the film. There are only a couple of complaints that I could possibly come up with for this movie, and it is almost silly to even mention them, and, as you will see, they are complemented by the strong points of the film. But, given that I have just written the opening sentence for this paragraph, I might as well continue. First of all, I feel that not enough screen time was given to the flashback sequences. Now I do not imply that time be taken away from the continuation of the story of Michael, because to take anything away would be a great injustice; furthermore, to devote more time to the flashbacks would have made this already lengthy movie into one for the recordbooks, so perhaps the timing was appropriate. However, the movie did seem to have a sense of imbalance to it, which is why I mentioned it. On the other hand, there was an uncanny sense of connection between the flashbacks and the continuing story. 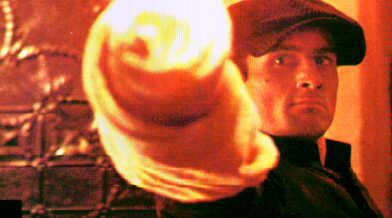 For example, towards the beginning, we see a scene of a young Vito giving way to that of a young Anthony Vito Corleone. We also see an older Vito, playing with his children which gives way to Michael, coming home after a long trip and not greeting anyone. But back to another one of my shallow complaints; my final one lies with the ending. It seemed all too familiar with the famous baptism scene. Thus, I didn't find it very original, even though it was done very well and served as a great climax to the movie. 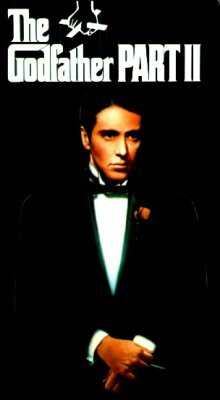 But what else can I say, this is a great movie, and most people I've talked to (or read from) have indicated that they prefer this movie over the original; furthermore, many of those hail The Godfather Part II as the greatest movie of all time. And I can't really find fault in their opinions, excepting that, as I have already mentioned, Brando's performance in Part I really made the difference, for me. Everyone should eventually see this movie. You kids out there can wait until you're older, but you too should eventually see it as well. How would you rate the movie The Godfather, Part II? There have been 41740 people to visit this page since Fri, Nov 5, 1999. And you are the first person to visit this page today!